John A. Dahlgren (1809-70), Rear Admiral, U.S.N. (PA). Inventor of the Dahlgren gun, Commander Washington Navy Yard, Chief of Bureau of Ordinance, South Atlantic Blockading Squadron, capture of Savannah, GA.
Gideon Welles (1802-78), Secretary of Navy 1861-69 (CT). Donald McNeill Fairfax (1821-94), Commander (later Rear Admiral) & Secretary of the Navy. Commander during the war aboard the "San Jacinto" when it removed Mason & Slidell - The Trent Affair. Hiram Paulding (1797-1878), Rear Admiral (NY). 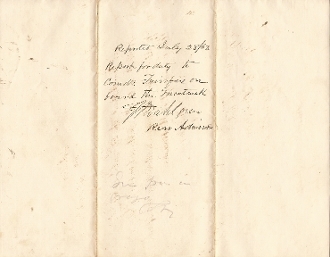 Document Signed (DS) containing the signatures of Welles, Dahlgren, Paulding and Fairfax, Navy Department, 3rd July, 1863, order for J. Henry Sellman to report for duty on the U.S. Montauk. "...Your orders to the Gem of the Seas are hereby revoked and you will proceed to New York without delay and report to Rear Admiral Paulding for a passage by the earliest public conveyance to Port Royal S.C., and on your arrival there report to rear Admiral Dahlgren for duty on board the U.S. Iron-clad Steamer Montauk. Report for duty to Comdr. Fairfax on board the Montauk. There are two additional endorsemnts by D.M. Fairfax and Hiram Paulding on the front of the document.